With the 2018 midterm elections now over, American Legislative Exchange Council (ALEC) state legislators, lobbyists, and Koch operatives return to Washington, D.C. today for ALEC’s annual “policy summit” to promote an agenda only fossil fuel companies could love. 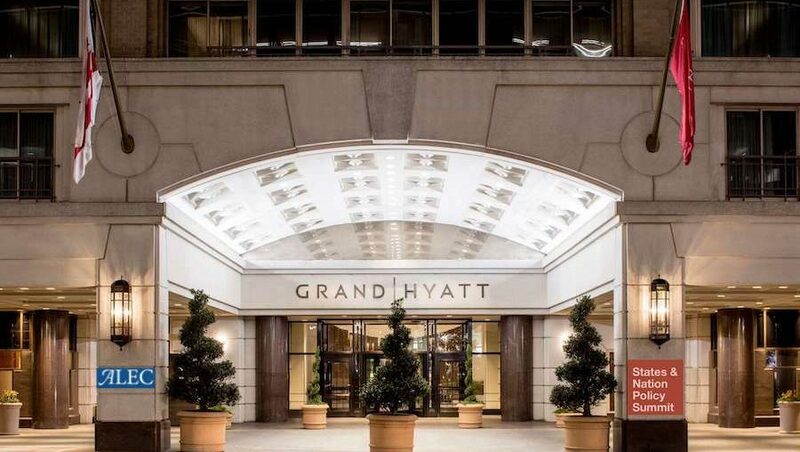 Instead of returning to the Trump International Hotel where ALEC held its 45th Anniversary Gala back in September, members will meet at the four-star Grand Hyatt Washington, a short walk from the White House. ALEC will not only embrace extreme Trump positions at the summit, members get to walk in the footsteps of scandal-plagued Interior Secretary Ryan Zinke by taking Department of the Interior tours. Intrepid ALEC members can follow the well-worn trail of oil and gas lobbyists to Zinke’s door, whose secret meetings, expensive trips on charter planes, and pay-to-play politics have prompted 11 investigations into abuse of power and conflicts of interest. So far, featured speakers at ALEC’s summit include U.S. Secretary of the Department of Housing and Urban Development Ben Carson, U.S. Senator Ted Cruz (R-TX), and ALEC hero Mark Janus, the put-up plaintiff in the union-busting Janus vs. AFSCME Supreme Court case which dealt a major blow to public sector unions last summer. Other speakers include Director of the Office of Management and Budget Mick Mulvaney, National Review’s Ramesh Ponnuru, Tennessee State Senator Brian Kelsey, and the father of supply side economics, Arthur Laffer. While many new cookie-cutter bills are on the plate for this meeting, nonbinding draft resolutions outnumber new draft bills. Just days after the federal government released an alarming report predicting increasingly deadly consequences from climate change that threaten to shrink the U.S. economy by as much as 10 percent, ALEC dives off the deep end to embrace a series of policies that will worsen the climate catastrophe. But ALEC does not stop there. In its twisted version of “environmental stewardship,” ALEC will consider the Resolution Concerning the EPA’s Underground Injection control Class VI Rule to allow states to sidestep an Obama era regulation requiring EPA approval for “clean coal” plants’ plans for underground storage of carbon dioxide. If approved, states could follow North Dakota’s lead and regulate underground carbon dioxide storage instead of the EPA, despite concerns of CO2 leaking into the air or water or causing earthquakes. ALEC also is introducing a Resolution in Support of State Carbon Dioxide Pipeline Corridors to promote the development of infrastructure to move CO2. CO2 is used by fossil fuel companies to extract crude oil in what is called “enhanced oil recovery.” The Governors’ Partnership on Carbon Capture was formed in June by Montana’s Gov. Steve Bullock and Wyoming’s Gov. Matt Mead on carbon capture policies. Louisiana, Kansas, Oklahoma, and Utah are also involved. New Model Policy Discussion: Resolution Urging Congress to Support Allowing Twin 33-Foot Trailers on American Highways, which encourages giant diesel guzzling trucks. Resolution Supporting Equal Tax Treatment for All Vehicles, which eliminates tax subsidies for electric cars. Resolution to Oppose Federal Intervention in Competitive Electricity Markets, which experts tell CMD appears to advance natural gas industry interests over nuclear energy and coal. Resolution to Support Competition and Consumers Choice in Electricity Markets, which appears to take aim at distributional utilities (typically “monopoly” utilities) that are seeking to “compete” in the retail energy market. There are some retail companies that are scam artists, but there are others that seek to sell products like 100% renewable energy. Resolution Supporting Individual Property Rights; Private Land Use for Energy Development, which lauds the supremacy of personal property rights (like the right to put a fracking rig in your yard). Statement of Principles on Electronics Recycling Programs, which discourages states from creating policies for the disposal of the mountains of toxic electronic waste being generated in communities across America. Once again, ALEC meeting attendees will have an opportunity to hear about the right-wing’s drive for a constitutional convention to rewrite the U.S. Constitution. At last summer’s annual convention, ALEC legislators were treated to presentations by hatemonger David Horowitz, former Sen. Tom Coburn (R-OK), and Tea Party founder Mark Meckler on why we need a new Confederacy and how to fight the opposition. Horowitz’s offensive presentation triggered coverage by the Center for Media and Democracy (CMD) and a letter of protest from 79 civil rights and reform groups. Horowitz threatened to sue CMD and Verizon quit ALEC, saying its values did not reflect the company’s. This time around, ALEC has invited “Let Us Vote For a BBA” to present its Let Us Vote For A Balanced Budget Amendment Resolution. Although not listed on the meeting agenda, the presentation is likely to be given by co-founder David Biddulph, who already has an ALEC profile for his work in the Balanced Budget Amendment Task Force. The new BBA resolution calls on Congress to hold “an Article V Convention for proposing a Balanced Budget Amendment (BBA) and related fiscal limits” when 34 state Article V applications have been submitted. Twenty-eight states have passed resolutions calling for a constitutional convention on a balanced budget amendment since the 1980s, but advocates suffered a setback when three states voted to rescind last year, and they were unable to pass any additional resolutions in 2018. CMD reported in July 2017 about infighting between “con con” factions over the legal validity of the count and how many resolutions and applications were still legitimate and could be counted together. ALEC is also discussing the Student Safety Scholarship Act in the education task force. Based on a law passed in Florida, the bill would give public money to kids bullied, or physically or sexually assaulted in public schools so they can attend private schools. The ALEC model bill provides “the parent of a public school student who was subjected to an incident listed…an opportunity to transfer the student to another public school or to request a scholarship for the student to enroll in and attend an eligible private school,” but does not indicate how the program should be funded. Critics argue that the Florida law creates incentives for misuse, as families could create situations to take advantage of the scholarship. Also, there is no requirement in the law that participating schools be inclusive. The Huffington Post found that 10 percent of Florida schools that signed up for these scholarships have zero tolerance policies for LGBTQ students, and others promoted prejudiced ideas about different races and religions. Many participating schools also have strict hair policies that ban students with styles like dreadlocks or hair wraps, targeting students of color. The ALEC agenda notes that attendees to the meeting will also consider amendments to the controversial School Turnaround and Leadership Development Act and the Forming Open and Robust University Minds (FORUM) Act. Stay tuned to @ALECexposed @ExposedbyCMD for all your ALEC news! Arn Pearson, Mary Bottari, and Scott Zimmerman contributed to this report. Update: ALEC removed the Occupational Licensing Recognition Act and the Worker Parity Act from its agenda the morning of November 28, 2018, and added the Union Dues Act. ALEC is simply an arm of the Kochs and the alt-right crazy pseudo Christian wingbof the Republican Party. Oil and Gas industry folks help write the proposed energy legislation, non-scientists help write health care and ecology legislation, non-education folks help write the anti-public education proposals…you get my drift. It’s a horrible organization.